I am going to build this pedal, but first I have to be sure about everything: how are the pots standing, with the knob up or with the knob on the other side? And for the AC128's I will use germanium transistors, but is the other one also a germanium? The pots are shown as if you're looking at the flat back of them with the lugs pointing down (and so what you would see looking at them from inside the box). So in that position the numbering is always 3, 2, 1 from left to right. Im really not very experienced in building electronic circuits, but i've finished my woolly mammoth and my fuzz factory. The woolly mammoth sounds great, it actualy sounds exellent, but my fuzz factory doesn't sound so well. There is a bit of distortion, but only when i turn all the pots fully open. My first tought was that the transistors would be standing wrong, but i've double checked them and they are right. Maybe you can help me to get it sound right. Excellent, I'm really glad you got it going and thanks very much for the pics, they'll be a good addition to my collection. the are both different, which is the best, or is there no difference? Both are fine but the membres.multimania.fr grounds the effect output when the pedal is bypassed which can stop noise bleeding through into the bypassed signal. With something like a Fuzz Factory that would probably be a good idea. What does the update do? Does it change the sound a lot, or is it necessary? Lugs 1 and 3 on the drive pot were the wrong way round, and as a result the cap should go between 1 and 2 instead of 2 and 3 if you were making the mod based on the old layout. In the updated version here I moved the pot mounted cap to the tagboard because there was a spare lug that wasn't being used, and so makes it a little more builder friendly. This is purely for ease of use though, and the result will be exactly the same if you solder the cap straight to the pot. I'm sorry for asking so many questions, but is it possible that the gate pot is wrong wired? Because it doesn't do anything when i turn the knob. The gate pot is definitely right. If you look at the schematic, there's a 470 ohm resistor from the collector of Q2 and base of Q3, the other side goes to the the Gate pot with the other two lugs going to ground which matches the layout. This layout has been verified as well. Have you definitely used a 470 ohm and not 470k resistor? Failing that are you sure the pot is ok? Hey, just reading through this thread. Have you got a working traditional schematic...? I'd just like to see whats going on with this thing. I changed the 470 ohm and the 47k. I switched them and now the pedal works fine. Thanx for all your clarifications! It may be worth getting a few extras as well rather than buying the exact number of the components, just in case you have any problems. thank you so much dude...how about internal fuzz factory in a guitar?which muse(matthew bellamy) use,it have only two knob on his guitar.Do you have layout for that? Finally finished (well, electronically if not cosmetically) a silicon FF build. Heres a couple pictures for you. Thanks for the boards. Like you I also managed to break one of those Alpha DPDTs by tightening too much, and something wierd is going on with a SHO I built with the Mill Board, but ive built three of those already so I muight just give up! Excellent, thanks for sharing the images. Yeah you've got to be careful with them, although to be fair apart from the one I tightened to death I haven't had a single other failure for anything else, so they seem to be otherwise holding up well for me. That's weird about your SHO though. Mosfets are prone to die sometimes due to static, but three is a bit weird. There are certainly no issues with the combination as I've made a few SHOs now using those boards. Let me know how you get on. Ive built 3 SHOs previously with regular footswitch setup, this was the first i tried with Mill Bypass. Alright Mark, figured out the wierdness with the latest SHO build, was simply the fact the footswitch was tearing itself apart. With a new footswitch, the effect is perfect, and the Mill Bypass avec LED is working as it should. Might be pestering you for more boards soon! cheers buddy, your blog and Melx has really helped me out. Excellent, glad you got it sorted. I definitely prefer not to use the split washer with the switch because you just can't tell when the resistance is due to the washer and when it's actually the clasps holding the switch together. Without that washer it was more obvious when you'd tightened to the required torque. Hi, do you have vero ? I Built this sweet tagboard layout, blew my socks off! That's excellent, thanks for sharing your pics and vids, also for the Mayer Fuzz. Glad the layouts are useful to you. Hey, I am curious on what your thoughts would be on changing the 470 ohm resistor with a 1K ohm resistor? I know that it is following the schematics exactly, but what are your thoughts? I love yo mod things, not always following the "rules"
I haven't experimented with it, but looking at the schematic it would alter the minimum and maximum levels of the Gate pot. I don't suspect the difference will be that great. - Since you said to use an 8 column tagboard, does that mean that each vertical column is connected? Or is each hole separate? - For the jacks, are they MONO or STEREO? - Where would the stomp switch fit into the schematic? - Which switch from this selection would work the best? 1 - I just say columns as an easy way to calculate the width. The top and bottom tags are separate, so you could make up the boards yourself with a thin piece of wood and turrets screwed in top and bottom to wrap the component leads around. Even better if you can get them, use eyelets and a setting tool, push the leads through the eyelets and cover them with solder. Then you can make up these boards for next to nothing. Just make sure you get long enough eyelets to go through whatever board you use. 2 - Mono, unless you want to include a battery which is switched by the DC adapter. Then you'd need a stereo for the input socket. If you aren't using a battery and switched adapter then you can use a mono socket for the input, forget about the ring connection and solder all the socket sleeves to ground. awesome! and would this PNP transistor work instead of the AC128? The shopping list looks OK to me, but I'd probably get 5 or even 10 of the transistors to be honest. They're very cheap and it's not worth the risk of leaving yourself short if you damage them. They are quite robust but you're going to have to bend the legs about a bit, so it's always a possibility. You can try the 2N2907 but the circuit is designed for germanium transistors so even if it works, I don't think it will sound as intended. Not a lot of the big electronics stores sell germanium transistors now but you should be able to pick two up for a couple of dollars on eBay. Try the 2N404 as an nalternative which is more readily available. The two germanium transistors were always going to be the expensive part of the build. The only other thing I may suggest would be to get some sockets for the transistor which can be soldered in place and then allow you to swap and change transistors without having to solder. Do a search in the shop for PCB header pins, they usually come in a strip of 40.
ok, thanks. I was just looking at the "OC44 ( PNP) Germanium Transistor." the only reason being is because i am needing the parts sooner, not shipped from overseas. The only thing I would say is to use 1/4 watt for all the resistors. The larger ones are unnecessary and will be more difficult to seat in a tagboard build. In an eyelet or turret build when you don't have the size restraints of tagboard it doesn't matter as much, but things do get tight with larger components. Also bear in mind that a Fuzz Factory in a 1590B is a tight fit to cram everything in. Make sure your measurements are precise, especially the pot spacing because there isn't a lot of room for error. Yeah those look fine and being matched they should work perfectly in there. Make sure you put Q1 and Q2 in the right place so the gain is correct (they should be marked up from smallbear). Everything else looks good to me and things will certainly be easier with a 1590BB. You could even have the box vertical with a row of 3 and a row of 2 pots so it doesn't waste width on your pedalboard. yeah, that is the size enclosure that i am going to go with! thank you for all of your help! i just ordered all of the parts and will post some pics when i am finished! Hey, when looking at the pots, is that the view from the BOTTOM of the pot, or from the TOP with the knob? Awesome! So I got everything wired up and I get no sound when the switch is turned on. I get the LED to come on, but no sound. When it is switched off, the sound runs through the pedal. I am using this schematic for the power supply without the battery. But I was needing to know if I am supposed to have separate grounds, or can they all come together. For ALL of the grounds in the pedal? I built this pedal with the refered layout. Don't know why, but when you activate the switch, you get the same clean sound of the guitar than when you have the pedal switched off. I've been checking all connnections, continuitys, transistors, and everything seems fine. Any clue to look for? You'll need to post a front and back pic to see if we can see anything. High res preferably so we can see more detail. Thanks for your answer Ivlark. Luckyly, there's no need to send pics.... I remembered a similar problem that I had with a Metal Muff (clean signal on pedal switched on) and the problem was a JFET blown out. So, even though on this layout there's no JFET everything pointed on as the problem was the 2N3904, that was not working as it should. I just did put a new one on the socket, and the Fuzz Factory started to roar! Thank you for such a great layout. With the new 2N3904 and two AC128 (HFE 55, HFE 75) it really rocks! Hello! 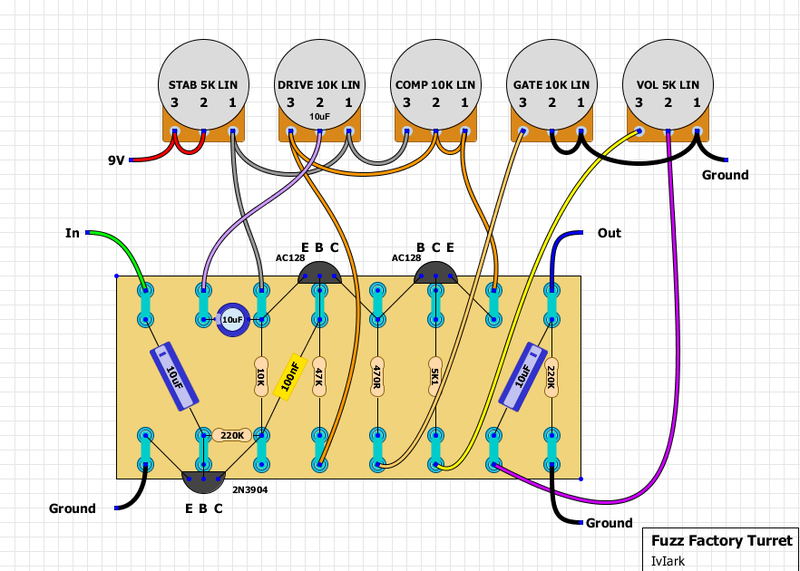 I just finished my Fuzz Factory build based on this layout here. I was tossing up between this and the vero layout, but wanted to try something different, so I gave this a shot. I'm very pleased with the results! I added a "bass" switch which puts 2 .680uF caps in parallel with the 0.1uF cap. I also ommitted one of the orange wires from the pots to the board, and made it an on-board wire, and transferred all the pot-to-pot wiring to vero-mounted pots. The interesting thing I found out is that the hand-made zvex fuzz factories have the "stab" control wired the other way (according to the demo videos I've seen and settings tables on the net), whereas this circuit and the new cheaper fuzz factories have it the other way about (that is maximum voltage level, or "normal" fully counter-clockwise) I think that seems sensible, zero being "normal". I used some weird Russian transistors from the 80's as you can see. Thanks for taking the time to share your work. I get a great deal of pleasure and satisfaction building something that works first time! Hi there! Built this project not once, but twice. Found a mistake I made on the trannie orientation so I completely rebuilt my board. Checked twice, three, four times and everything is wired correctly. Also used new trannies, even the 2n3904. All I get when pedal is engaged is rf signals. I have 9 volts at all points in circuit, even at ground. I just can't get my head around this! It's getting very frustrating (and expensive)! Circuit should work on the bench, outside the box, right? Didn't want to get it all crammed in there to find it doesn't work again. Is this the problem? I'm a novice of course. Maybe you could give me a couple of pointers? 9.14 volts on all trannies and points on the board except base of 2n3904 which is 9.02. I'd you're getting over 9V on every transistor pin you've got serious problems with the build, it sounds like you have a short to the supply everywhere! Can you post a high res pic of the build? how do I connect the input/output jack? Is there another circuit for this connection or is this circuit sufficient? why does the second potentiometer have 10uF written on it? just one last question, why the capacitor with 100nF is yellow? need 4 capacitors 10uF to mount the circuit? not as identical with the Zvex demo.. but Good tone for a DIY. here a list of what i found all NOS... do you have any idea what vintage pedal i could replicate with my stash? hope you can view this... sorry not updated pix.. changed my mind for the OC44. Can you use a standard boss negative tip adapter with this pedal (assuming you wire the negative to the tip of the plug and positive to the sleeve)? Yeah man this circuit is designed for a regular negative tip supply. Would a tone-pot be difficult? I'll use 2N3906 instead of AC128... any advise about biasing? Can I please Ask what voltage are the Capacitors, i am just very confused of which ones to get.